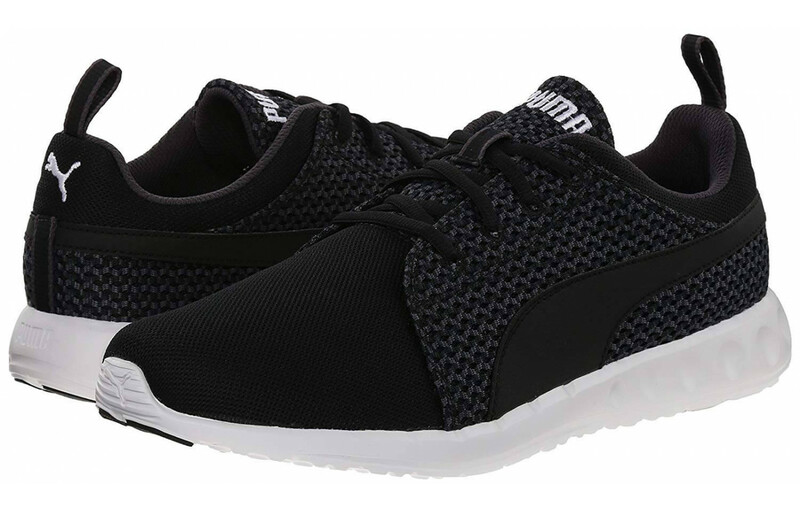 Puma Carson Runner Knit - To Buy or Not in Apr 2019? A popular trend in the sneaker world right now is the knit look and Puma has jumped on that bandwagon with its Carson Runner Knit shoe. This sneaker is an updated version of the company’s Carson Runner, the main difference between the two being the knit midsole and tongue. Puma also chose to remove the internal toe box to give the shoe a sleeker silhouette when comparing it to its predecessor. These fashionable sneakers have a breathable mesh toe box and a removable Eco Ortha Heel sock lining so you could pop your own insert in the shoe if you wanted to. The familiar Puma formstrip logo is prominently displayed on either side of the shoe over the knit upper. This shoe comes in both men’s and women’s sizes and is offered in lots of fun colors and patterns as well. The outsole of the Carson Runner Knit sneaker features ‘EverRide’ durable rubber that is both durable and flexible. Although not a lot of running technology goes into this low profile sneaker, it can be worn for running on the treadmill, short to moderate outdoor runs, or to the gym for cross-training. It’s also a great choice to wear as an everyday sneaker or for a shoe to travel in. This is a super cute, lightweight, and functional sneaker that will make an excellent addition to your workout or casual wardrobe. This sneaker has a blown rubber outsole that provides a decent amount a cushioning for the wearer’s foot. Its high abrasion resistant rubber gives lots of durability and ensures protection against major ground debris. This blown rubber is the brand’s EverRide technology and is said to help its comfort, protection, and shock absorbency. 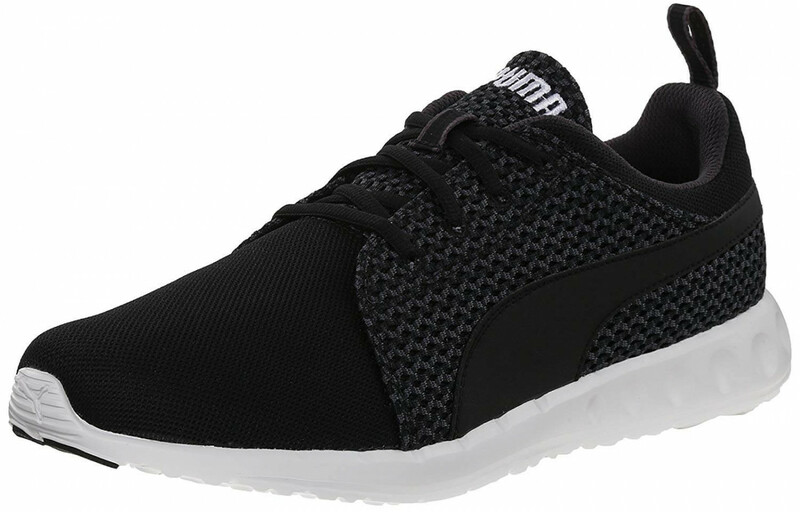 The Puma Carson Runner knit offers a midsole that is made of injection molded EVA foam which is manufactured to be very responsive and springy as well as being lightweight. EVA foam is a great material that lends itself to maintaining its shape extremely well so the midsole won’t wear out quickly. Other than the EVA injected foam, the midsole doesn’t offer a whole lot of other support in the running shoe department, but it is pretty comfortable. The upper portion of the Puma Carson Runner knit differs itself from it’s Carson Runner predecessor in that it offers a fashionable knit design on the top portion of the upper as well as on the tongue. The front part of the upper, the toe box area, is made up of a breathable mesh material which makes it light and airy. The inner portion of the upper is made up of a super soft sock-like lining to make it ultra-comfy. All in all, the upper doesn’t have a whole lot of bells and whistles, but it does prove itself to be aesthetically pleasing. With its lightweight mesh and knit upper, combined with EVA foam insole, this sneaker weighs in at just around 7 ounces. This makes it a pretty lightweight running shoe, which nowadays, proves to be the way in which most running shoes are headed. Although this isn’t necessarily considered to be a minimalist design, it does lend itself to being a super lightweight option. The great thing about this sneaker is that it is lightweight and offers a decent amount of cushioning, making it more supportive than a minimalist running sneaker. One of the major design features in the Puma Carson Knit Runner is its breathability. Because it is made up of mainly mesh material at the front of the sneaker, it allows air to come in and escape easily, making it a very breathable running shoe. Because it doesn’t have a ton of technological advanced options in the upper of the sneaker, it allows for minimal fabric and maximum airflow. This is an excellent shoe for someone concerned about blistering due to sweaty feet. When it comes to comfort, these sneakers offer a decent amount of comfort for what you pay. These aren’t the most flashy running shoes, offering the best of the best in features when it comes to running performance, so for running shoes, they can be pretty comfy for short distances. However, if you are planning on wearing these for long-distance or trail-running, that might not be such a great idea. Even though they have a cushiony lightweight insole, they aren’t meant to withstand super long distances and heavy terrains. 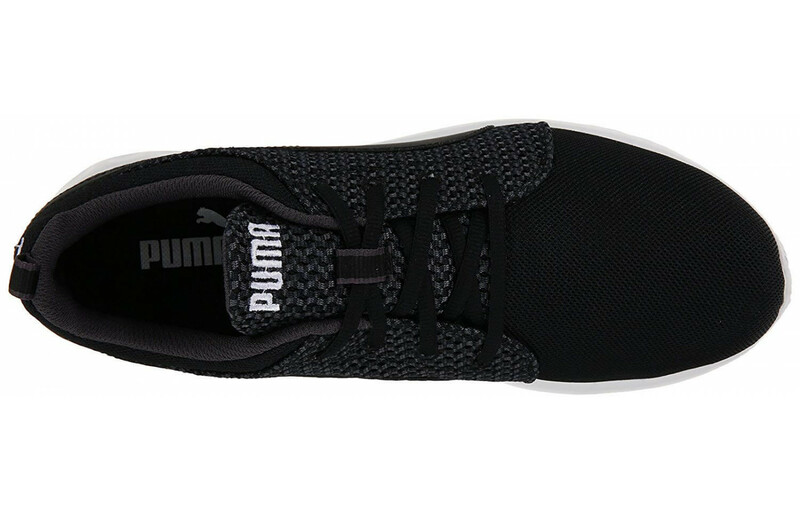 The style is where the Puma Carson Runner Knit really shines. This updated version of the Carson Runner offers many of the same features as its predecessor but also offers a great element of style in the fashion-relevant knit upper design. It has a sleek, low profile silhouette and looks great with your running or workout attire as well as your everyday wardrobe. With a great selection of colors and designs available, the Puma Carson Runner Knit is sure to please almost anyone when it comes to style. This sneaker isn’t a performance runner which means that it's not designed to withstand a large total of mileage. It is a lightweight fashionable runner and can be worn casually or for light workouts. The EVA foam retains its shape well, so it has that going for it in the durable department and its outsole is pretty decent in terms of light usage. These wouldn’t be great running sneakers for someone training for a long-distance race when it comes to durability. The upper and outsole are likely to wear out before the 300 to 500-mile running shoe recommendation. This is neither a long-distance running sneaker nor a trail-running sneaker so it isn’t necessarily designed to protect your feet if you choose to do either of these activities with this sneaker. However, it does offer a decent outsole made up of EverRide material which gives it some durability and flexibility as well. This means the sneaker can be work for walking or running on a lightly rugged trail but nothing too off-road. Since the silhouette is more of a fashionable low-profile design, it doesn’t give much protection for the ankles. Most of the protection in these sneakers is in the outsole. The responsiveness of the Puma Carson Runner Knit is pretty minimal. The responsiveness that is present in it comes from the EVA foam midsole which is somewhat springy and retains its shape well. This means that the sneaker is more responsive than the average casual sneaker but it’s not anything out of this world in this department. Support in the Puma Carson Runner Knit comes mainly from the cushiony EVA foam midsole. This midsole absorbs some shock as the runner’s foot strikes the ground and allows for a small level of cushion on takeoff. Without this midsole, the shoe wouldn’t offer a whole lot as far as support. The upper portion of the shoe is semi-supportive due to the fact that it isn’t really stiff, rather, it is made up of breathable mesh and a knit design, allowing it to conform more to the foot. This makes it more supportive than a stiff upper which may not conform well to the wearers foot-shape. The outsole of this shoes isn’t super-rugged in design so heavily wooded or rocky terrains should probably be avoided when wearing the Puma Carson Runner Knit. The EverRide material on the outsole does have a minimal design to aid in gripping the ground solidly when it comes to a treadmill, smooth surface, or lightly-rugged terrain. It is probably best to wear this to the gym or on the road or sidewalk. This sneaker won’t do too much damage to anyone’s wallet. It is an excellent option in terms of a budget running shoe or even as a fashionable casual shoe option. 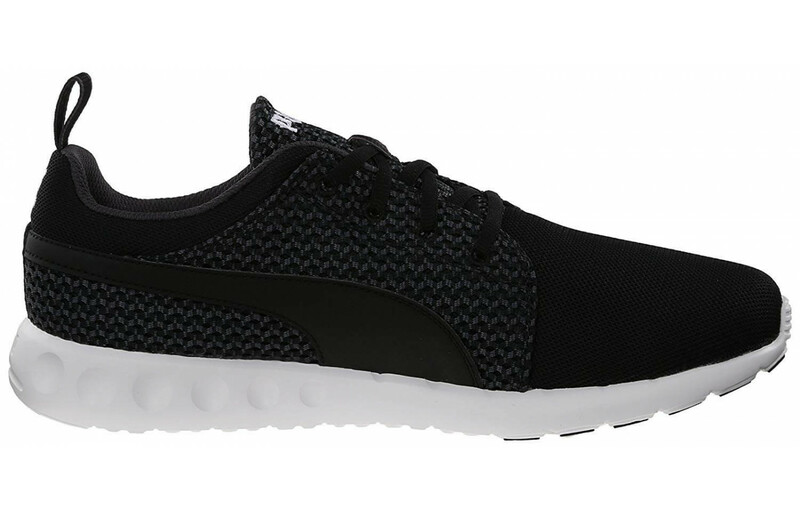 Running shoes can be pretty expensive but the Puma Carson Runner Knit is a sneaker that won’t cost you much. With that said, as a performance running shoe, it doesn’t offer a whole lot of super exciting options, so make sure you keep that in mind. 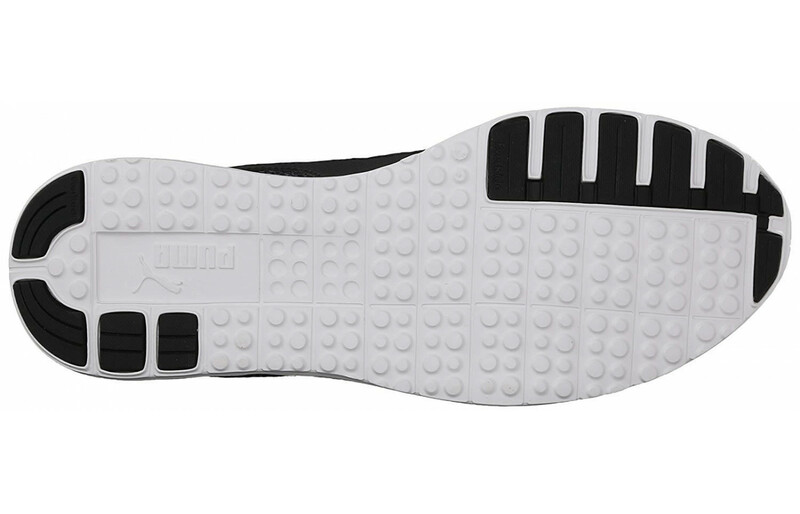 The EverRide outsole offers a minimal level of traction with a bumpy design on the bottom. These sneaks won’t help you grip a whole lot if you plan on wearing them on a wet surface, but have enough traction on them to keep you steady on a treadmill or smooth running surface. Again, these wouldn’t be great for trail running or for running long distances because the traction won’t give you a whole lot of grip or milage. Flexibility gets decent marks in this stylish sneaker. Because it doesn’t have a whole lot to it’s upper or much other than an EVA foam midsole and a flexible EverRide outsole, this sneaker is pretty flexible. With its lightweight upper and bendable midsole and outsole, it certainly won’t feel stiff on anyone’s foot. The Puma Carson Runner Knit is not a stability running sneaker which means it’s not manufactured to limit motion within the shoe. Over-pronators might not want to invest in these snazzy little sneakers if they want to actually run in them because they aren’t the most stable shoes out there. They are lightweight, breathable, and flexible but don’t offer much stability other than having a snug lace-up system. The drop on this sneaker is a little larger than average at 10mm. It isn’t a stability or performance training running shoe, nor is it a minimalist running shoe so this is a pretty standard drop for a fashion light-distance running sneaker. Most wearers won’t have a problem with the drop of this shoe. When it comes down to it, the Puma Carson Runner Knit sneaker is aesthetically pleasing and affordable enough to wear as a cross-trainer, short-distance running shoe, or as a casual sneaker. There are a lot of running shoes out there that offer a whole lot more in the support, responsiveness, and performance departments than this one but that doesn’t mean it can’t be used for running. Puma is a well-known company when it comes to athletic shoes, so they know what they are doing. The company is also known for its style so that’s another thing these kicks have going for them. In the end, they may not be the best in terms of training for major races, but they can most certainly be used for light workouts or for your jaunts around town; all while not emptying your wallet.